Yesterday I had a live lesson on my Facebook Page on what you need to do business with the British. You can see the lesson recording here. I shared 10 tips with my audience and one of them was to be diplomatic. In other words, it was about how to use polite and diplomatic language when dealing with the British. The English Language originates from Britain and as the British place so much importance on politeness it’s no surprise that the English Language evolved to reflect this ‘obsession’. We’re real sticklers about using ‘please’ and ‘thank you’ but we also insist on using diplomatic language when dealing with people both privately and professionally. 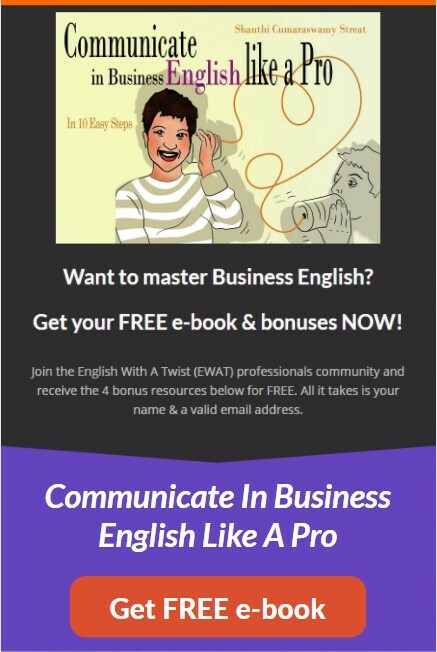 The real challenge for many non-native speakers is how to sound diplomatic when doing business in English. Is it a cultural thing or can non-native speakers actually learn to be diplomatic? The good news is that there are language (verbal) techniques, as well as non-verbal techniques, that will allow you to get a much more successful response than you might have had before. Culture does have a role to play in the use of diplomatic language in English. For example, the British prefer to use indirect language whereas the Americans are more direct. Nevertheless putting the cultural differences aside, they do share common expressions for certain situations and this is what I want to share with you in this post. 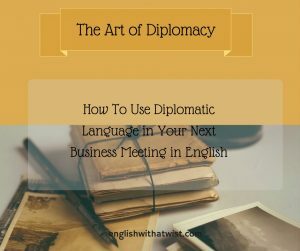 Let’s take a look at some situations where diplomatic language would be important if you were doing business in English. In all the above situations, you’d want to soften your language. Well, you’d be expected to soften your language if you’re using English as the language of communication. So how can we soften the tone and language and sound more diplomatic? I have to cancel the meeting. This is direct with no apology for giving bad news. If you were delivering this to a superior or a client this would sound harsh. Wouldn’t you rather hear this instead? I’m afraid I have to cancel the meeting. I’m so sorry but I have to cancel the meeting. Unfortunately, something’s come up and I have to cancel the meeting. Actually, I have to cancel the meeting. To be honest, I’ll have to cancel that meeting. Softeners come at the beginning of the sentence and prepares your listener or reader to the bad news you are giving them. They are a linguistic tool to soften the tone of your content or to show politeness when you’re speaking. Imagine you are giving an order or making a request, using modal verbs like would, could, may or might would be of huge help. I could do with more time. It would be so helpful to have more time. You can rephrase a negative sentence to make it sound more positive. I’m afraid I haven’t finished the report. The use of ‘I’m afraid’ softens the bad news but we can soften it even more by doing this. I’m afraid I’ve not been able to finish the report yet. Using be able highlights your attempt to finish the report was stopped by circumstances beyond your control, for example, heavy workload, awaiting more data and so on, and NOT by your failure. Using the word ‘yet’ emphasises your willingness to finish the report and that you’re still working on it. Negative sentences formed with can’t or won’t can make you as a speaker sound especially unhelpful and negative. I can’t deliver the goods on time. I won’t have the report ready by then. I won’t be able to have the report ready by then. I’m not in a position to say when the goods will be delivered. I’m not able to say when the goods will be delivered. I am unhappy with this arrangement. I am not entirely happy with this arrangement. I am not totally happy with this arrangement. And now if you combine some of these techniques, you get the best example of diplomatic language in use. Here the qualifier ‘very’ modifies the word ‘expensive’ and increases its quality. If we use qualifiers to decrease the quality of a word, they make great ‘softeners’ like in technique one. These qualifiers will help you especially when you have to give bad news to your superiors or a client. We are having problems with the new medical device. We’re going to run slightly over budget. The launch plans are behind schedule. The launch plans are a little bit behind schedule. Ahh, I love this one because having been a woman in a man’s world (Finance) for many years, I learned early on that when making suggestions, I would be better off using this technique instead of being too direct. This is not only a linguistic issue but a gender one too. From a language point of view, yes it does sound a lot better, especially if you talking to a superior or a client. What we’ve done is to take a forceful sounding statement and turned it into an indirect suggestion by adding ‘not’ and making it into a negative question. We use shouldn’t, wouldn’t and couldn’t for this purpose. We must inform the shareholders immediately. Wouldn’t it be a good idea to inform the shareholders immediately? Couldn’t we arrange to inform the shareholders immediately? You could also use the past continuous tense to sound more diplomatic. I hope we can come to an agreement today. I was hoping we could come to an agreement today. I think we should offer Sally the job. I was thinking we should offer Sally the job. I plan to organise a conference call to discuss this issue. I was planning to organise a conference call to discuss this issue. While I advise my clients to avoid using the passive voice in business writing, it can be useful to use it to soften your language and introduce more politeness. You have broken your promise! A promise has been broken! Here we are removing the subject (you) from the sentence completely and focusing on the object (the promise) and the action. The effect here is to place the blame on the action and not the person. You said you were going to sign the contract today. We were told that you were going to sign the contract today. It was agreed you would lower your fees. Now that your language tool box is full of phrases, you’re fully equipped to be a diplomatic ambassador for the English Language! PS I am indebted to MyEnglishTeacher.eu for their invaluable resource in helping me write this post. Business Skills: How To Deal with Hostile Questions in a Business Meeting....in English.